Welcome to Gardenview on Calhoun! Living area looking out to a spacious courtyard. Cozy living room with dining table for four. This kitchen makes cooking a family affair. The kitchen is newly renovated and waiting to be used! Look up recipes at the bar counter. Access to the balcony is out the french doors. Crawl into the luxurious hotel-grade bed linens. The master bedroom has a King size bed. The upstairs bathroom has a tub and shower combo. These two twin beds are great for families. This second bedroom also has entry to the balcony. The balcony overlooking the courtyard. The balcony is accessible from both bedrooms. Beautifully landscaped courtyard. Stay relaxed. Courtyard with seating area. Completely private and fenced in. Entrance to the courtyard. Entrance to the courtyard. Entrance to the home. Explore Savannah's rich history. This home is located in Savannah's Historic District. Plenty to entertain only a short walk away. Just off of beautiful Calhoun Square, this two-bedroom, one-bath townhouse has everything you could want in a vacation home. 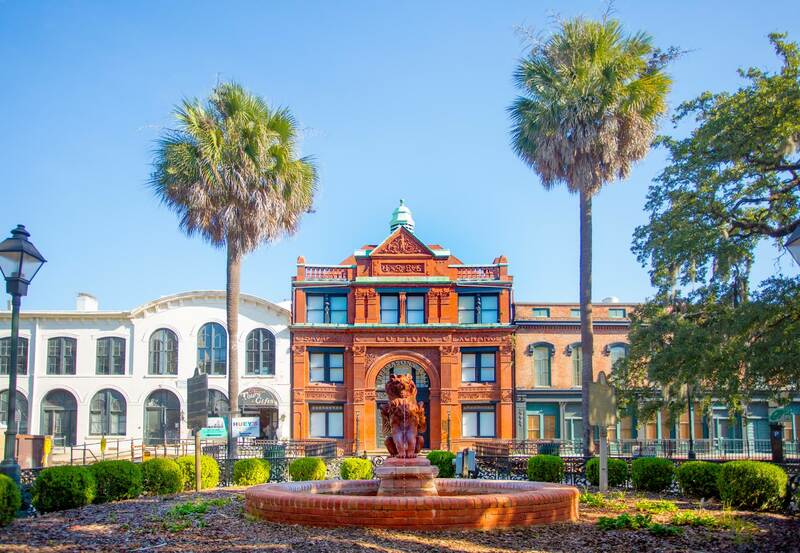 Within walking distance to all Savannah has to offer, you’ll simply have to pick a direction to begin your day of exploration. The first floor of this home has a spacious living area with plenty of comfortable seating and a large flat-screen TV, so you can spend some time catching up on your favorite shows. The dining table seats four and is right next to three floor-to-ceiling bay windows overlooking the private courtyard. The adjacent kitchen has been fully renovated and has a modern subway-style backsplash and stainless steel appliances. You’ll find additional seating and a grill outside, perfect for a gathering of family and friends. Upstairs you’ll find both bedrooms, each with their own access to the balcony through matching French doors. The first bedroom has a king-sized bed while the second has two twin beds. The shared bathroom has a shower/tub combo and pedestal sink. If you do bring a pet to this dog-friendly home, you'll be in a great location to walk over to Mother Matilda Beasley, the only dog park in the Historic District. 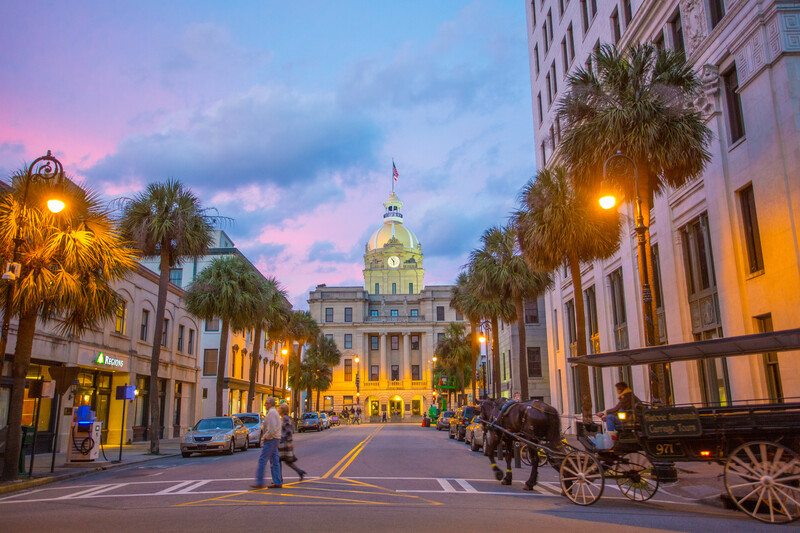 A short walk to beautiful Jones Street will bring you to Clary’s Cafe, the setting for several breakfast scenes in Midnight in the Garden of Good and Evil, and a favorite breakfast spot for locals and visitors alike. 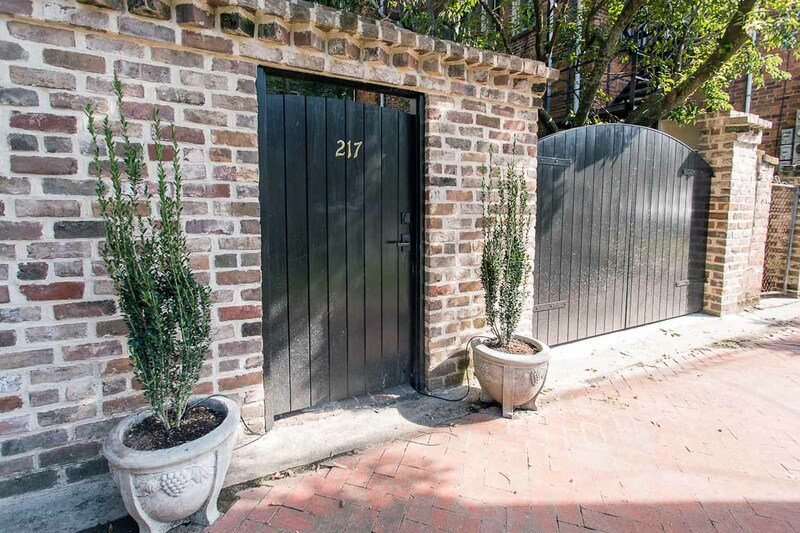 - The large, private and manicured courtyard is a Lucky Savannah favorite. With Savannah’s mild climates, many of our guests spend as much time enjoying the peaceful courtyard as they do the interior. - Browse for antiques at Alex Raskin’s, or tour the famous Mercer-Williams House on nearby Monterey Square. We can welcome your dog companions at this pet friendly home, but ask that you find other arrangements for cats, birds, and other furry friends. There is a $75 pet fee (non-refundable) per dog, with a 35 lb. maximum weight limit per dog and a limit of 2 dogs per reservation. Some homes may allow larger dogs, please inquire for more information. Great location, lovely garden apt. We enjoyed our stay at this lovely little apartment! Kitchen was well stocked with what we needed, the home was clean and the location is perfect! Walking distance to many attractions, parking was easy, great amenities and easy to relax in. The private garden was especially nice! We were able to let our pets out in the yard to enjoy the outdoors with us when we weren't walking in one of the nearby parks. I highly recommend this property. Loved the location. The house is very pretty,interesting, and comfortable. The walled in garden is fabulous. Great for us, our dog, and our visiting grandson. The kitchen appliances are a bit tired. We plan to rent next year, and hope to see an updated stove. It's a good street for parking in the historic district. The management staff is prompt, courteous, and helpful.Worth touring the Massie Heritage Center across Calhoun Square and Mickve Israel one block away. My wife and I had spent a day touring Savannah a few years ago and decided then that we needed to spend more time in the city to truly appreciate all it had to offer. We rented The Garden View on Calhoun for two weeks in January. It was the perfect place for us. The apartment had everything you'd ever need including a full-sized washer and dryer. The beds were comfortable and there was ample closet space. Be aware that the only bathroom is upstairs. The courtyard was very special and on our warmer days we would have lunch or coffee outside. What made this place even better was the location. We were towards the south end of the historic district and were positioned so we never had to pay for parking. You could park in front of the unit or in back behind the courtyard. (NOTICE- keep track of the days you need to move your car for street sweeping! It's posted on signs along the street.) Everything was in walking distance, but we brought our bikes and locked them in the courtyard at night. We went everywhere on our bikes- River Street, Kroger, Back in the Day Bakery, Telfair Museum, and all the historic houses. We even rode our bikes to a symphony concert! It made a HUGE difference for us and I would strongly recommend it. The staff at Lucky Savannah were great to work with and they made check-in and check-out a breeze. If we were ever to go back to Savannah we would seek to rent the Garden View without hesitation. Bear Claws from River Street Sweets- delicious! The location is perfect and the house is gorgeous, clean and comfortable. The outdoor garden/patio is pretty big and a wonderful place to sit and have coffee. The street is quiet and very close to restaurants and shops. My sisters and I take a "sisters" trip each year and are so happy we chose Savannah and this charming property. We had a wonderful time! We loved Gardenview! It was excellently appointed and was only steps away from Calhoun Square. It was perfect for our friends' getaway weekend, and full of charm. Very clean and comfortable. We can't wait to come again! This was an ideal place for our visit to our SCAD student...close by everything, comfortable and super clean, an amazing kitchen, simply perfect. Negatives: musty smell and air-conditioning did not keep up, and needed filter changes. Noreen, thank you for choosing to stay with us at Lucky Savannah! We're glad you experienced so many positives with your rental and we wish we were made aware of the negatives so they could have been corrected during your stay. Please know that we offer a 24/7 Guest Line that is always ready to make sure your stay is nothing short of perfection. We hope to see you again soon! We really enjoyed our stay at this location! Cozy and comfy, and right near the free DOT line. The company was great when I called with a really dumb question, and there were even little flashlights in the kitchen that we borrowed when going on a nighttime tour. Using the door code was really easy and checkout was a breeze! This place was the perfect size and location for our family of 5! We loved the private courtyard too! 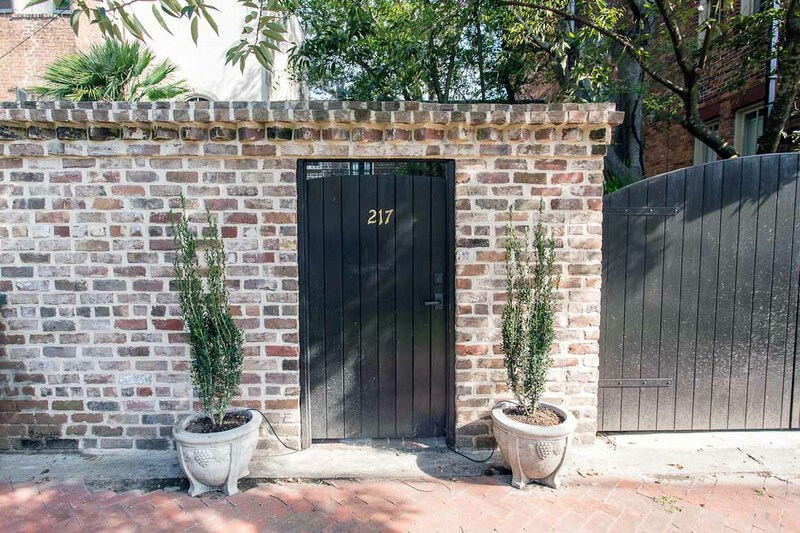 This beautiful carriage house is exactly what you want staying in Savannah. It is close to everything, and very quiet. The garden is beautiful and the best place to have coffee in the morning. The kitchen is remodeled and is perfect for making breakfast and having drinks. The bathroom is upstairs, nothing fancy, but does the trick. The only complaint I would have is that the air conditioning does not cool the upstairs very well. We couldn't find the fan in the room with the twins, until we left. We could have used it. Also the twin bed not in the frame could use a better frame. It's not terribly uncomfortable, but sags a bit and squeaks every time you turn. Would recommend a better bed frame. Still a beautiful place and would definitely return. We absolutely love this place! This was our second time staying at Gardenview on Calhoun. The house is wonderful and the courtyard is perfect for our dogs! Great location and very pleasant neighborhood. The folks at Lucky Savannah are great to work with. I guarantee we will be back! Gardenview is a lovely home. Great location to restaurants, downtown, the parks. Very charming.. Everything was perfect. We visit Savannah every year and this was our first time trying a home rental. This place was cute and charming; the perfect size for a couple. The best part was the private courtyard. We brought our little shih tzu along and she absolutely loved the outdoor space. The only challenge we had were the stairs, as they were slick for the dog and hard for her to manage - a runner along the steps would be a nice addition. The location is convenient to many of the popular spots and Clary's Cafe (which is fabulous) is just around the corner. Hi Michele! We're so thrilled to hear that you chose Lucky Savannah for your first vacation rental experience. Thank you for your kind suggestions. We look forward to hosting you again soon! This property is adorable and makes you feel so at home. The location was fantastic! Would definitely stay there again!! We look forward to having you again soon, Kristen! We absolutely loved our stay here. Location was great, house was perfect, courtyard was great for our dogs and us! Very relaxing and roomy. Everything went perfectly smooth from start to finish! Thanks for choosing Lucky Savannah, Phillip! Nice place , convenient to everything. Had nice experience. First time using home away for lodging. Adorable 2 bedroom place. Upstairs was little stuffy unless running fans, but it was a very warm week. Prepare guests about the very slippery moss on bricks outside door, myself and friend slipped first morning we left for a walk. Unit was very clean! Had anything we needed. Hi Mechelle! Thanks for choosing to book with Lucky Savannah. We so appreciate you letting us know of the moss, and our operations team has already resolved the issue. Please know you're privy to a Return Guest Discount next time you stay with us! We brought our luggage in from the back, the courtyard was a lovely gem of historical Savannah. I could not get enough of it. We were immersed in history from the moment we arrived. Janet, thanks again for choosing Lucky Savannah! Gardenview on Calhoun is truly a downtown gem, and we're so pleased to hear that you enjoyed your stay there. See you again soon! The Calhoun carriage house was a wonderful place to stay for our Halloween visit to Savannah. It was the perfect size for 4 people. Very clean and had everything we needed to prepare a nice meal and then eat it outside in the beautiful courtyard. This was our 4th rental in Savannah and this was by far our favorite. Claudia, thank you again for choosing Lucky Savannah for your Halloween getaway! We're so happy to hear that you enjoyed your stay, and look forward to hosting you again next year! This was my first trip to Savannah and I had an image in my mind of what I'd hoped it would look like. The street that this rental is on was just perfect; beautiful live oaks with spanish moss lined street, gorgeous brownstones and a historical square just yards from the front door. Great neighborhood that is walking distance to most everything we wanted. The house was comfortable yet modern, cozy yet spacious. The enclosed courtyard was perfect for our two cocker spaniel - JUST PERFECT. We will be back. One small problem - while the wood floors are gorgeous, they are slick and we slipped a couple of times. Hi Sharon! Thank you for choosing Lucky Savannah to host you in the Hostess City of the South! We are so glad that you enjoyed your stay and the location of the rental. It means the world to us that we could offer you perfection, especially upon your first stay to the Hostess City. We hope to see you again soon! Beautiful property, great location. Looking forward to going back sometime. Thank you for choosing Lucky Savannah for your Christmas vacation, Kirk! Thanks for choosing Lucky Savannah, Kate! Short week stay but filled due to awesome location. Everything within walking distance, lovely home, walled courtyard perfect for our little pup. Could not have been better. The house was perfect for our stay in Savannah. We spent much of our time in the courtyard which was so private and relaxing. Didn't drive anywhere as you walk out the door and you're in the middle of it all. Clean, convenient, cozy. Hi Ruth! Thank you for choosing Lucky Savannah! We are so glad that you enjoyed the cleanliness of your unit, the convenience, and the wonderful courtyard. We hope to see you again soon! The courtyard is a showpiece but the house us also quite nice. Well-furnished kitchen, nuce bedrooms, comfortable living room. Thanks again for choosing Lucky Savannah, David! We had a wonderful trip. The house was exactly what was depicted on the Lucky Savannah website. The property was very clean and well maintained and we really liked the location. Parking although not on the property was very easy to find on the street in the front and the back. The courtyard was a great spot to just relax and catch some rest and sun. The only negative thing I have to say is that the internet was very spotty and weak. The only time I could get on line is if I was standing right at the router. However overall great stay lovely house. Super cute place with an absolutely gorgeous outdoor courtyard! We sat out there every morning and evening and it was beautiful and peaceful. The house was adorable, too. Some of the light switches didn’t work, but everything else was fine. We had an issue with our door code and they sent someone right away to fix it, which was nice. The location was good because you could basically walk everywhere we wanted in the historic district. And it was right on the border of the city where parking was free so we found a spot right out the back patio doorway so unloading the car was a breeze. Nina, thank you for choosing Lucky Savannah! We're so glad you enjoyed the home and courtyard! We're also glad you were pleased with our service throughout your stay. That is our goal, and thank you for letting us know we hit the mark with you. Come and see us again soon! Excellent location and charming town home. It added to our experience by staying in this historic area! The condo is beautiful. It looks like it had been fairly recently renovated. The furniture was all comfortable. The kitchen was well stocked. We didn't cook, but we easily could have. The courtyard was beautiful. We had issues the wifi and they were extremely friendly and helpful in getting it resolved. The location was fantastic. We were in easy walking distance to a huge portion of the sites we wanted to see (as in, a lot of the trolly tours drive you within a block of this condo). The neighborhood was quiet and was beautiful. The only slight quirk is that you have to park on the street, but the parking was free and it would be that way anywhere in the historic areas. It was actually more than I had hoped for. Mary, thank you for choosing Lucky Savannah! We're so glad you enjoyed the beauty, comfort, amenities, and location of your rental. We hope to host you again soon! Thank you for choosing to stay with Lucky Savannah! We are thrilled you all had a fantastic stay. We sure hope to have you all as our guests again in the near future! We loved the location. Perfect to walk every were. Thank you for choosing to stay with Lucky Savannah! We are so glad you had a great time here in Savannah. The location of Gardenview on Calhoun is definitely great! We are so glad you all enjoyed the location, and were able to walk every where! We hope to have you as our guests again in the near future. This was a beautiful property in an awesome location. The garden is unbelievably peaceful. There was a musty, damp smell throughout the home that may be a problem for sensitive lungs. It was a special place for us. The floors were beautiful. Thank you for choosing to stay with Lucky Savannah! Gardenview on Calhoun is a charming, comfortable home that offers a great location and a great peaceful courtyard. We are so glad you agree! We will most certainly have our maintenance team check on that, and make sure it will not be a problem for future guests. We hope to have you all as our guests again soon! The title of this review describes our stay at this location. My two year old grandson was constantly saying he wanted to go to Mimi's House. We were so comfortable and we all felt like we were at home. The location was beautiful and was convenient to everything. The furnishings were nice and we appreciated the décor very much. The owner provided so many extra touches, i.e,. children's books and games. This was a great place to stay! Thank you for choosing to stay with us! We are so glad you thought it was a great place to stay! We hope to have you as our guests again. Other many great homes, as well as this one, awaits you! We found this rental through AirB&B and could not have asked for a better location for our visit to Savannah. It was clean, comfortable, and convenient for walking tours of the attractive squares, parks, and architecture of this historic city. The Lucky Savannah staff were very responsive in assisting to make our four-member family visit very enjoyable. Thank you for choosing to stay with Lucky Savannah! We are so glad you found this great home for your stay. We are thrilled to hear the home was clean and you found it to be comfortable! Our team tries their hardest to make sure everything goes great during your stay. This is a lovely vacation rental. We loved the location, decore, and outdoor garden space. Our only complaint is the bathroom tub drain. It was clogged up after our first shower and we couldn't bathe our toddler. Thankfully husband is handy and cleaned it for us without the inconvenience of calling in maintenance. I have asked for the cleaning fee up be reimbursed but have yet to hear back from management company. I realize the property is old - cleaning out the tub drain should be routine maintenance because having your paying guests pull out hair is disgusting. This won't stop us from coming back or recommending but will make sure to ask that drain is cleaned on our arrival. Thank you for choosing to stay with Lucky Savannah! We are glad to hear you all enjoyed your stay at Gardenview on Calhoun. We do ask all of our guests to contact us right away, so we are made aware of any maintenance issues. Housekeeping does their best to clear all of the drains, and make sure the tub drains properly upon cleaning. We will be sure to correct this for future guests! We do appreciate the feedback, and hope to have you all again soon. We stayed in this wonderful property for my son's SCAD graduation. I can honestly say it surpassed our expectations. Great location, close to everything. Property was clean, updated kitchen was well equipped with everything we needed. Beds were comfortable. The beautiful private courtyard was a bonus. The mangement company was very responsive to our needs. The only issue we had was the upstairs got a bit warm at night (ceiling fan did not work in master bedroom). We never called to report it because we were so busy, but I am sure they would have responded if we did. We will definitely recommend the property and plan on staying there on our next trip to Savannah. Perfect accommodations for the four of us. Location was great, within walking distance of most things. Beautiful town and would definitely stay here again. Thank you for choosing to staying with Lucky Savannah! We are so glad to hear you all had a great time. Gardenview on Calhoun is a great home, in a great location! We can't wait to have you all as our guests again soon. Loveliest Garden Around - Location, Location, Location!! We adored our month in Savannah!! Gardenview on Calhoun is exactly that. The private courtyard was landscaped beautifully and it is a perfect spot for outdoor dining and relaxing. Steps from Calhoun Square, couple of blocks from Forsythe Park and walking distance to grocery, liquor store, and everything else. Especially our favorite spot - Smith Bros's Butcher Shop, Wine and Gourmet Grocery. Relatively easy finding a place to park - no meter on street parking. Well maintained and equipped. Great customer service when needed. Thank you Lucky Savannah!! Hi Diane! Thank you for staying at Gardenview on Calhoun for your extended trip to Savannah. We look forward to hosting you again soon! I thought Savannah was a great place to be. Staying in this particular place left a bit to be desired for the amount we paid. The unit was nicely kept, but the sofa was uncomfortable. The beds were amazing, I will admit. The ceiling fan in the master bedroom did not work which made for a few uncomfortable nights. We couldn't get the wifi to activate on our phones. I was also perplexed as to why there were no dressers? No chests of drawers? Living out of a suitcase during our stay really kind of put a damper on the vacation. There's something rewarding and settling about unpacking your clothes and "moving in" to a vacation rental, and that never happened for us. Overall, I was disappointed with the rental. Thank you for choosing to stay with Lucky Savannah! We do ask for all of our guests to notify us of any issues, so we can have maintenance and/or housekeeping come by. We strive to provide all of our guests with a great stay from check-in to check-out. 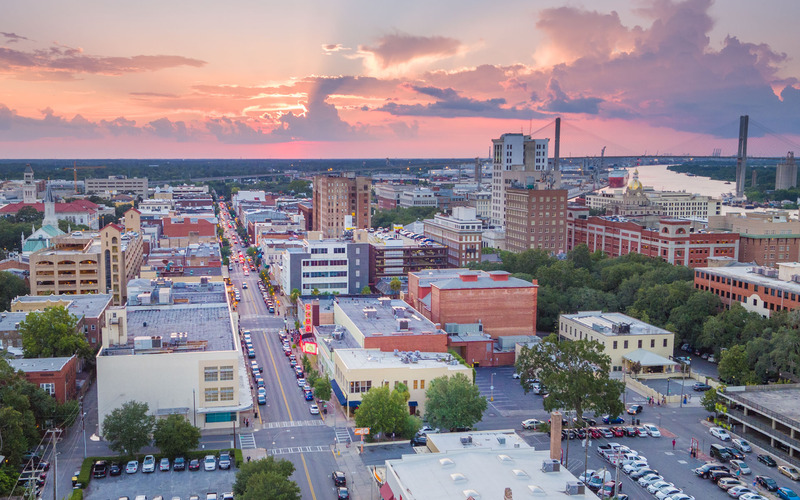 We hope you all decide to come back to beautiful Savannah very soon! We were extremely pleased with the rental. We did have a small problem with the ceiling fan not working but rental company handled it promptly. House was great and this is definitely the way we will travel going forward. This house was such a cute and quaint place in a quiet neighborhood. Loved the wood floors and the overall feel. I loved spending time reading my book in the courtyard. The only and I mean only negative I could say about the house was the bathtub didn't drain properly. We were standing ankle deep in water during our shower and it would take a long time to drain. Hopefully it will be fixed by the next renter. Loved Savannah and can't wait to go back. A wonderful home, well furnished, great location. The only problem is that the air conditioning did not cool the upstairs at all. This is an older home and perhaps there's no A/C upstairs, but it was so uncomfortably hot (even at night) that we I couldn't sleep in the bedrooms (upstairs) - I slept on the couch downstairs. Hi Marty! Thank you so much again for choosing to stay with us. We're so glad to hear you enjoyed Gardenview on Calhoun and have made note of your suggestions. Please know that you're privy to our Friends and Family discount next time you stay with us. Looking forward to hosting you again soon! My husband and I celebrated our 35th anniversary on our first visit to Savannah. The carriage house was perfect for the 2 of us. We could walk everywhere: the historic district, Forsythe Park, and the river (the river was the longest walk-15 minutes). Kroger is 2 blocks away. We enjoyed evenings in the garden. The management company was prompt and courteous for a minor issue. The parking is free on Taylor St; just note the street cleaning signs on the weekend to see if you need to move your car overnight. It was very hot in September, but we had a marvelous time. The Gardenview on Calhoun was a gem! The courtyard in the back was so relaxing and pretty. The location was great and within walking distance to restaurants, shops, and river walk. We absolutely fell in love with Savannah and will for sure come back soon! Our family stayed at this gorgeous property for an extended weekend prior to the onset of school. I looked at a number of rentals in Savannah and chose this one based on reviews and location. The property was above and beyond our expectations. It was well appointed, location was perfect (walking distance to everything yet extremely quiet), and had a lovely assortment of books on sightseeing and local history. The bathroom had minor cosmetic flaws, but given the age of the home and the climate are to be expected. Our family felt at home immediately, would recommend this to friends, and cannot wait to return! Absolutely perfect experience. For the haunted house buffs, we had a beautiful view of 432 Abercorn which added to the charm of the home. Hi Bernadette! Thank you so much again for choosing to stay with us. We're so glad to hear you enjoyed Gardenview on Calhoun and our beautiful city. We pride ourselves on being more than a vacation rental company and are pleased to hear that our staff was helpful during your stay. Please know that you're privy to our Friends and Family discount next time you stay with us. Looking forward to hosting you again soon! We stayed at Gardenview for a girls weekend to Savannah and it was the perfect fit for us. The house was adorable and well within walking distance to most of the places we went. The Lucky Savannah app was very comprehensive and gave us all of the information we needed for our stay. Also Sidney was extremely friendly and helpful! Hi Annemarie! Thank you so much again for choosing to stay with us. We're so glad to hear you had a wonderful girls weekend in our beautiful city. We pride ourselves on being more than just a vacation rental company and are so glad our friendly staff and free app made your stay extra special. We look forward to having you again! Gret place, I loved living here for 5-6 weeks.. only problem was construction at the neighbors for 3 weeks, but not their fault.. great spot, well furnished and a great kitchen. Hi Nick! Thank you so much for staying with us for 6 weeks. We're so happy to hear you loved living here and look forward to having you again soon. Loved this cottage and the beautiful courtyard. Walking disrance to everything..(river walk was about 15 min but a really nice walk). Only suggestion is that they add a dresser with drawers...otherwise it is the perfect place to stay in Savannah. Especially if you are bringing your dog! Hey Karen! Thank you again for staying at Gardenview on Calhoun. We're so happy you enjoyed the location and will absolutely forward your suggestion along to the team. See you again soon! This place provided us the space and comfort to function as a family. The streets can be a bit loud at night and the electric cooktop is annoying, but everything is well maintained with a unique blend of decor, nice linens, healthier choice of bath soaps and the master bed was very comfortable. Window treatments would be nice for the bay window. Thank you again for staying with us, Milissa. We're so happy to hear that the home was fit for your family, and appreciate your window treatment recommendation. We look forward to hosting you again soon! This is a charming, little house with a fabulous yard. Very comfortable. Good kitchen. Would definitely choose this property again. Thank you for staying with us, Lauren! Charming spotless apartment in quiet location. Thank you for your kind words, Patricia! We found this little cottage delightful and well equipped, with great location for walking Savannah. Would definitely stay again. Thank you again for staying with us, Lynda! We loved this apartment. It was in a great location. Quiet and so close to Calhoun Square. We brought our little dachshund with us and the back courtyard was perfect for her to explore. Thank you so much for allowing us to stay in such a beautiful place. I would definitely stay here again! Hi Terry! We're so glad to hear that you stay was nothing short of wonderful and relaxing. We look forward to hosting you again soon! I fell in love with Savannah! Beautiful home! Perfect location, away from the busy streets, but only by a couple short blocks. Can walk all the way from the river to the house in 15ish minutes! Parking was readily available, right in front of the door- and no meters on the front street or back street of the home! Plenty of quiet parking. My family felt safe throughout our stay, enjoyed the trolley tours through town (there is a stop right around the corner from the house!) and thoroughly enjoyed grilling in the courtyard and cooking meals in the kitchen. Everything was well stocked. Our kids had a great time playing scrabble and jenga- thanks for having those! If I could make any recommendations, it would be to give the bathroom shower a good scrubdown (some yuck in the grout lines of the tiles), put a small chest dresser in the king size bedroom, maybe a tv in each of the bedrooms upstairs (the kids would have enjoyed one for sure!) and find a way to get more AC upstairs. It was quite hot up there, not to the point we couldn't sleep, but only because we had 2 fans on high blowing on us. Overall, wonderful vacation home, and we will definitely want to stay here again! Thank you! Hi Stefanie! Thank you again for choosing to stay at Gardenview on Calhoun. We're so happy to hear that this home helped you fall in love with Savannah. We look forward to hosting you again soon! We recently visited Savannah for a week. We enjoyed a wonderful stay in the Historic District. Our stay made all the more special by our wonderful rental apartment near Calhoun Square. A wonderful place which is nicely furnished. There are stairs to the bedrooms so keep this in mind. The place was well equipped, beds were comfortable and the heat/air worked fine. Location is good as it is within walking distance of everything and yet lays outside the busy area. Parking was right in front without parking meters. I would recommend this vacation rental. Very nice accommodation, highly recommended. This was a most comfortable and perfect place to stay. The location was great and the accommodations were fabulous. Nothing was overlooked in setting up this home. It was obviously updated recently and very tastefully done. Loved having the private courtyard which worked great for my dog too. I would highly recommend this property. Very clean, excellent service and would love to go back. Very homey and relaxing. Parking was not a problem. Absolutely loved it! Out family of three enjoyed a beautiful week in Savannah. The home and location were perfect. The courtyard was delightful. The furnishings tasteful and the kitchen highly functional. I didn't want to leave. After a week it was starting to feel like home. Hope to return some day and would stay at the Gardenview on Calhoun again.Thanks for sharing your home with us. This house was exactly as pictured down to the throw pillows on the couch. The house was equipped with everything that we needed and was very comfortable. The house was pretty clean, just some minor dust/debris on the floor around furniture and under the beds. The rental process was very easy to complete and loved having the app to get any information and to check out electronically. Will be back! Gardenview on Calhoun was the perfect property for our stay in Savannah. I traveled with a friend and we each had our own bedroom and plenty of room to either hang out together or find separate niches. The patio behind the house is just lovely! We could easily walk to historic downtown and enjoy the many good restaurants. We especially liked Collins Quarter and The Public. Lucky Savannah was a terrific management company. I had some questions about little things like the a.c. upon arrival and they called me back immediately and helped me figure things out. If you are driving, parking was fairly easy to find in proximity to the house. We had a great time in this house! We loved our visit to Savannah and our stay in the Gardenview on Calhoun property was wonderful! The location was perfect as we came to tour SCAD and enjoy the lovely historic district of Savannah. The home was spotless, quiet, and perfect for our visit! We also appreciated how organized and helpful the Lucky Savannah folks were throughout the process and will definitely use Lucky Savannah Rentals again. This little house was perfect for our first anniversary trip. We really enjoyed the closed in patio, the beautiful kitchen, and the close proximity to the park. The place was clean and had everything we needed to be comfortable. We would definitely stay here again. Lovely stay in adorable house- well equipped, just charming! The property is in a good location and well appointed. The beds are comfortable and we enjoyed the patio. We found some good breakfast and lunch restaurants within an easy stroll. Child proofing would be necessary as the stairs are steep but I'd recommend this very clean and attractive rental. We loved the house ! It was clean , everything we needed for the cooking was available , the beds were so comfortable !! The location was great to! Just nice to walk out of the house and be in town and at a store within a few blocks ! We had our little chihuahua with us and the garden area was ideal for her ! We hope to come back again !! We enjoyed our stay in this house for our first family vacation with our one-year-old. Overall, the house had everything we needed and was in a nice location. We did have an issue with the TV not working properly off and on, but the rental company was quick to try to fix the situation. If we could change anything, it would be to have some additional lighting in the dining area and bedrooms. We would stay again. We had a great time staying in this little home. It was very charming and cute! We loved the fact that it was downtown and we could walk everywhere; however, it is about a mile from the river front and good shopping. We were always able to find parking close by and didn't have to pay a meter. The home was very clean and nicely decorated. We will definitely be back to stay again! Renting the Cottage was easy. Finding a parking place not so easy. Had two cars both cars got $25.00 tickets, in the middle of the night, even though we had moved them once that day. Could not be a better location, only complaint with Cottage (we are 4 sisters) I could have sworn it was a bath and half, you have to go upstairs to potty and the lighting was not the best for makeup. The Cottage Living room looks just like the picture, if you look at the lounge end of the couch, that is where I slept, because there is only one TV and I am used to one at night. But that is me My sisters were find sleeping upstairs. All of us thought the Cottage adorable. Well worth the price. Did I mention I at 64 was the youngest there that is why the upstairs bathroom was a little inconvenient an the fact that it needs a half bath downstairs, I would move out the washer drying and put a half bath there. the home was perfectly located in Savannah. We were pleased with everything in the house. And our little dog enjoyed the courtyard. The only negative was the musty smell everywhere in the house.